A couple of months ago, Emma One Sock posted some Anna Sui trims that got me pretty excited. I had the idea of using one of these at the hem of a summer dress. Enter BWOF 7-2008-107. The magazine also shows a shorter version of this pattern as a tunic-length top. I decided I'd make the top using stash fabric, then if I liked it I would make the dress with the special trim at the hem. And because this is March, I'd be able to enter the garments in the "One Pattern, Multiple Looks" contest on Pattern Review - perfect timing. 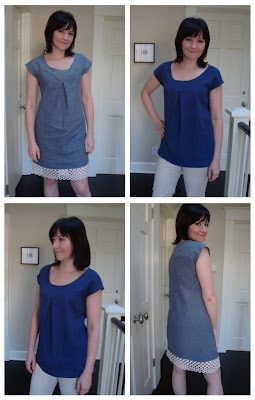 Top: Linen/lycra from the stash, it has a very nice drape. When I first bought this fabric a couple years ago, I had the folded yardage sitting on a table near a window and it faded along the folds. I was able to work around the sun damage for this top. 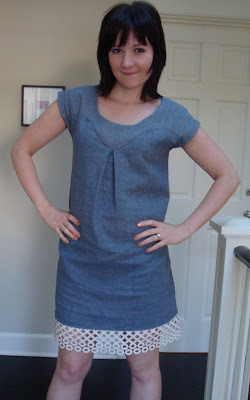 Dress: 100% linen from Gorgeous Fabrics and Anna Sui trim from Emma One Sock. Before cutting, I washed and dried the linen a few times to soften it. Then I read somewhere that Dawn dishwashing liquid is great at softening linen, so I picked some up at the drugstore and soaked the yardage in the sink. What I didn't know is how sudsy Dawn is! I rinsed the fabric in several changes of clean water, but every time I squeezed the fabric, it let out suds. A lot of them. So I put the fabric in the rinse cycle in my washing machine. It still smells a teensy bit like Dawn. Front yoke - I was a little nervous about sewing the curvy seam, but it was much easier than I expected, thanks to a lot of pin basting. I used narrow (1/4") seam allowances on the curved seams. After wearing the top, I noticed that the neckline tended to dip down, so when I made the dress, I interfaced the front yoke with Pro Weft fusible interfacing from Sew Exciting. Neckline finish - I finished the neckline of the blue top with a strip of bias fabric, turned to the inside and topstitched. However on the dress, I needed to hide the interfacing on the front yoke, so I stitched an extra front and back yoke together at the shoulder seams, sewed this to the dress at the neckline with right sides together, then turned the yoke unit to the inside. Burda tells you to topstitch to hold the yoke in place, but I stitched it in place by hand to avoid having topstitching. 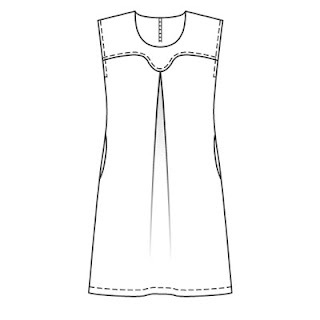 Pockets - I included the in-seam pockets on the top, but I omitted them on the dress. I forgot that I don't care for this style of pocket. They just flop around inside your garment and add bulk at the hips. No thanks. 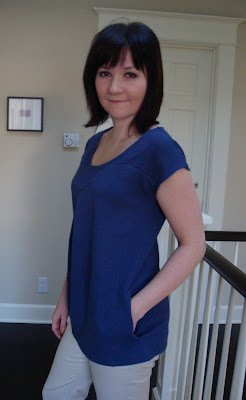 Center back - Most of the reviews of this garment on Pattern Review said that the center back zippers is unnecessary because the neckline is large enough to fit over your head, so I omitted the zip. Trim - The trim was machine sewn to the hem with a single row of stitches. At a side seam, I overlapped the trim ends, handstitched the top layer to the bottom layer in matching thread, and cut away the excess trim. I was surprised at how nice it turned out, it's barely noticeable. I'm really happy with how the dress turned out. I'm still trying to figure out what shoes to wear (which is why I cropped my feet out of the photos), nothing I have looks right. Sigh Guess I have some shoe shopping in my future. I can probably find something on 6pm.com. I was planning to make another top with this pattern, if only to give more oomph to the "multiple looks" aspect of the PR contest, but I have a feeling I'm going to be tired of the curved yoke look with these 2 garments alone, so enough is enough and I'm done with this pattern. I made this dress late last summer in a soft cotton which needed to be lined so all the 'innards' were concealed. It worked quite well but I said at the time that it felt like maternity so I know just where you are coming from! I feel the top works well on you and the dress edging is just wonderful. Good luck finding the right shoes. These both are darling and that trim is to die for. How about a gladiator sandal for the shoes? I like the curved neckline and your use of trim. I never would have thought of that! So cute. V. cute, and the top is not at all maternityish. Great job on the trim for the dress. Both looks are super cute. I really like the top- it doesn't look maternity to me. And the dress is adorable. Good work! I tried this dress and felt very maternity with the finished item. (Which is a complete bummer because I'm really proud of my curvey yoke & topstitching.) I think it looks great on you though - doesn't seem to balloon out. Wish I knew what the difference was.. Did you put the back darts in the dress or just the top? Both are very cute! I didn't think that the top looked maternityish at all. I love the trim on the bottom of the dress! Very cute top and dress. The trim on the bottom of the dress is fantastic. Both look great. The dress is especially cute with the trim. I always liked this pattern! I love the trim--drool! The trim on the dress is inspired! So cute! Love the trim on the dress...it was the perfect choice for this outfit! Love this dress. The trim is very effective. Your tunic/dress are awesome! The tunic is very much like my V8495. You just gave me the idea to make it dress length--thanks! BTW, the V8495 pulls over easily w/o a zipper or any closure. Maybe it just _feels_ maternityish, but it sure doesn't look it. So adorable! And I love that trim! I'm so jealous you found something to do with that trim! I've been admiring them too but couldn't think of a reason to buy. I love the pattern on you, esp the neckline and curved seam. Very cute top and dress, and on your figure not at all maternity like. On me, a different story I suspect! Great trim. How about white shoes? That looks so cute on you. Both versions are totally cute. Could you try a belt with the shirt version to make it less billowy? Great dress! It's very Marni spring 2009. I absolutely adore it in linen--and the trim really makes it so special. Your dress looks great, and so does your top! I've made this as the top version - and I actually don't wear it a lot, for the maternity reason. But, I should give the dress version a go. As always you did a great job. I like them both but truly like the tunic! I love the dress and the trim is the icing on the cake. I am impressed with that curved yolk. I have a tunic that has a similar yoke... we'll see if I get the same good results. Nice job! Both look great on you. The top doesn't look maternity at all. Those are both really cute!! Good work on finding the trim, too, it works perfectly here. I've always had this pattern in the back of my mind, but I was afraid it'd be too billowy... I suppose flowy fabric is the key here! i like the length of the top. not maternity looking to me. more tunic looking.